Toledo Museum of Art, By Sailko (Own work) [CC BY 3.0 (http://creativecommons.org/licenses/by/3.0)], via Wikimedia Commons. 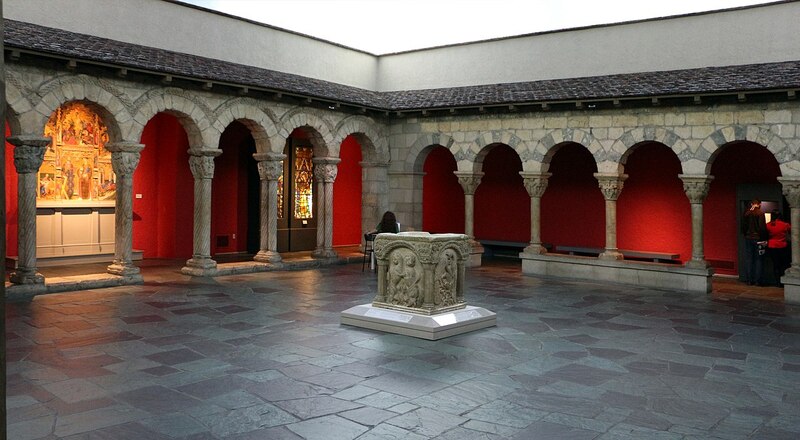 The Toledo Museum of Art announced in early April that it is selling 145 duplicative or minor artworks from its collections to other museums, and later, if not desired by museums, to the public. The artworks date to between the periods of Old Kingdom Egypt to Imperial Rome. The museum spent two years reviewing its collections to determine which objects could be deaccessioned without harming the quality and range of its collections. 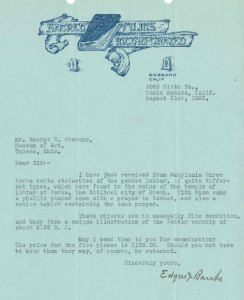 Eighteen of the objects chosen for sale were among the initial gifts to the museum from founder Edward Drummond Libbey, collected by him during a 1906 trip to Egypt. These are items that Christie’s deemed of insufficient value for a major public auction: the estimates range from $150 to almost $10,000. Toledo’s fall 2016 sale at Christie’s triggered complaints from Egypt, including by former culture minister Zahi Hawass, who demanded the items be returned to Egypt (although they were of types duplicated by the dozens in Egyptian museum collections) and by officials from Cyprus, who held that only other museums should have been able to acquire them. In the US, at least, the museum’s decision to market the items first to other museums has been widely supported, in contrast to the concerns expressed in the Toledo community regarding the first commercial auction sale at Christie’s. 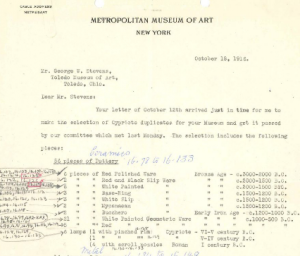 Catalog of Harlan J. Berk, Ltd. ,1916 Letter regarding acquiring duplicates from the Cesnola Collection from the Metropolitan Museum, NY; 1922 letter regarding offer to sell the museum three terracotta statuettes of the goddess Ishtar, a phallus, and a votive tablet, all for $100. While deaccessioning is accepted under general museum practices, there is no currently accepted standard mechanism for offering materials broadly to other museums. Under the special terms of the new sale, which is managed by art dealer Harlan J. Berk, Ltd., Association of Art Museum Directors (AAMD) member museums were first offered the chance to bid or purchase the antiquities, then museums accredited by the American Alliance of Museums (AAM) and only later, if the objects are unsold, will they be made available for public sale. The Toledo Museum’s solution to dealing with these duplicative or unwanted antiquities is similar to one suggested recently by former Walters Museum director Gary Vikan in an article appearing in Apollo magazine, in which museums would be encouraged to place artworks back into circulation when they were not needed for research or exhibition and their storage, insurance, and other maintenance costs became too burdensome on the institutions. Harlan J. Berk’s 90-page sale catalog includes donor biographies, copies of receipts and correspondence between Mr. Libby and many other donors and the museum dating to the original acquisitions.